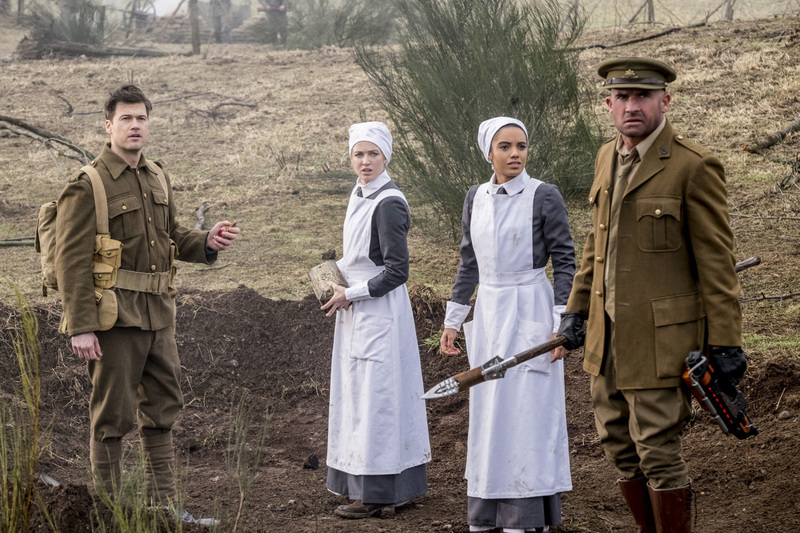 Preview images for the DC's Legends of Tomorrow episode "Fellowship of the Spear"
The CW has released some official preview images for the March 21 episode of DC’s Legends of Tomorrow, titled “Fellowship of the Spear”… and Wentworth Miller’s Snart is included in a few of the shots! The photos can be found below; underneath that, you can find a description with spoilers. IT’S WAR — The Legends must devise a plan to retrieve the last remaining fragments of the Spear of Destiny from the Legion of Doom. They find themselves in France at the height of World War I faced with the knowledge that they must destroy the mystical object. They enlist the help of a soldier by the name of John Ronald Reuel Tolkin (guest star Jack Turner) and find that the Spear is leading them into the heart of the war. Meanwhile, the team must all resist the temptation of the Spear, and the return of a former teammate. Victor Garber, Brandon Routh, Arthur Darvill, Caity Lotz, Dominic Purcell, Franz Drameh, Nick Zano and Maisie Richardson-Sellers. Ben Bray directed the episode written by Keto Shimizu & Matthew Maala (#215). Original airdate 3/21/2017.